Chakrasana : Vydya Health - Find Providers, Products. This posture looks like a wheel and hence the name. Lie down in the supine pose. Fold both legs at the knees taking sufficient distance between the feet. Bring the heels near the buttocks. Put the palms beside the ears against the floor and pointing towards the legs. Slowly raise the buttocks, back and the head and then look at the floor. Try to make the elbows straight. Stay in that posture comfortably. Gradually and slowly come back to the supine pose. It gives strength to the legs and hands. 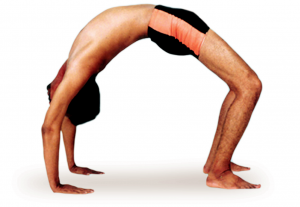 It improves flexibility of the spinal cord. It is beneficial to the nervous, digestive, respiratory, cardiovascular and glandular systems.